Here's very accurate description of this amazing game creation program from Europress' website: "Blazing a completely new trail into the realms of computer creativity, The Games Factory is the latest thoroughbred from the stable which has already produced such innovative titles as [Maxis'] Klik & Play and Corel Click & Create. Undeniably the most comprehensive game creation tool ever developed, it sets a benchmark for all game makers, whether you're a home user just wanting to have fun, or a professional programmer who needs to visualise ideas and mock-up demos. Five comprehensive tutorials make game creation easier than ever with The Games Factory. You are taken step-by-step through the creation of five different games which demonstrate many areas of game creation, leaving you confident to invent your own. As you progress in your game making career, you can take advantage of the Advanced Techniques facility which includes such topics as scrolling, artificial intelligence, adding gravity to objects, object priorities and randomness. A fun way to find out just how much you know about game making and to pick up hints, tips and facts. Each time you call up the quiz, it throws 10 random questions at you, then gives you a score. Questions come from a huge database, so you're always challenged!" 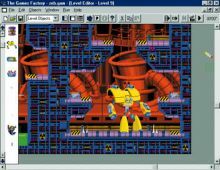 There is oerhaps no better proof of The Game Factory's excellence than the fact that there are numerous WWW sites dedicated to the program and games made by it. Many of these games have gone on to become niche shareware and commercial favorites. Definitely worth its weight in gold, and well worth the price. If you aspire to be a game designer but don't have any programming knowledge, The Game Factory is the best tool there is. Two thumbs up!